Canada celebrates its 151st birthday on July 1! No Canada Day plans? No problem! The Buzzer blog‘s got you covered with 9 epic things to do on Canada Day. There’s something happening in communities throughout Metro Vancouver. Perhaps the best part is they’re all transit accessible! So, dust off your Canada gear, and wear it loud and wear it proud on Canada Day! Hashtag your adventures with the hashtag #MyTransLink—we’d love to see them. Canada Day – SkyTrain and bus will operate Sunday/holiday schedules with modified, extended and increased service, so everyone can celebrate Canada Day! SeaBus will provide extra and extended service. July 2 – SkyTrain, SeaBus and bus will operate on a Sunday/holiday schedule, and the West Coast Express will not operate. Know before you go – visit translink.ca/holidayservice for all the details and plan your trip at translink.ca/tripplanner. Canadian singer-songwriters Serena Ryder and Brett Kissel co-headline the City of Surrey’s annual Canada Day celebration. There will also be an amusement park, midway games and interactive activities for all ages! TransLink will be there with the community engagement bus until 10 p.m.
Fun poll! What’s your favourite summer spot to visit with transit? #DenisthePlanner talks about White Pine Beach and other fun places you can get to on transit. The birds are singin’, the sun is shinin’ and it’s summertime! Here in Metro Vancouver, that means getting out and enjoying all that the city has to offer – from a relaxing day at the beach to a summertime hike. How lucky are we to have so many fun, beautiful places to pick from that are ALL accessible by transit! Vote below and let us know what your favourite summertime destination! If you don’t see your favourite summer hot spot, leave us a comment and tell us where you love to go. What is your favorite summer spot to visit on transit? We did this poll last year with a few different summer destinations. Take a look here for more transit accessible summer fun spots! Did you know? TransLink has seasonal service from Coquitlam Central Station to Buntzen Lake and White Pine Beach! Use our Trip Planner to plan your route. 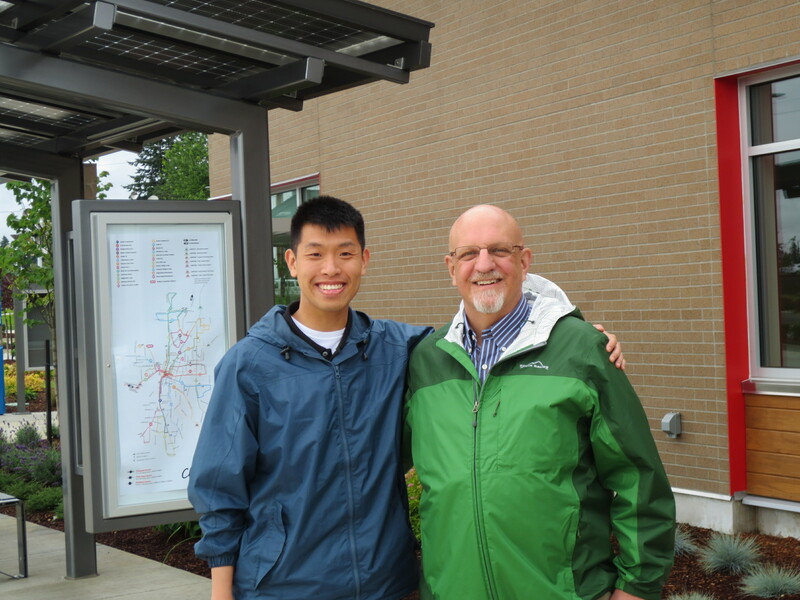 The Buzzer blog documented the travels of TransLink’s William Hui while he took public transit from Vancouver, British Columbia to Portland, then Salem, Oregon! 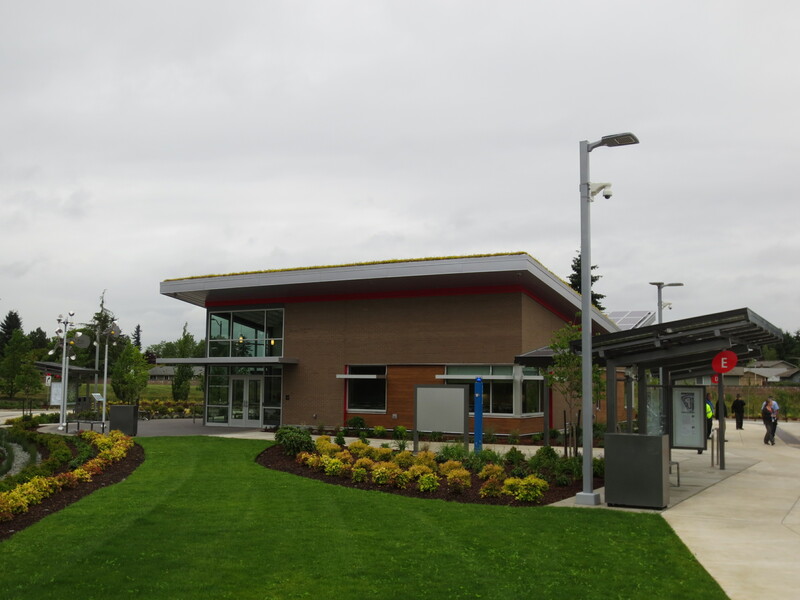 In the last leg of his travels, William had the opportunity to tour around the Salem-Keizer Transit Centre in Oregon. LEED-quality building for passengers and transit staff. While I was in Salen, Stephen Dickey, Director of Transportation Development at Cherriots (Salem-Keizer Transit), kindly gave me a tour of their system. Stephen first showed me around their transit centre downtown. It has the capacity for 20 vehicles, but it was undergoing some rehabilitation when I visited. Hopefully they had the construction done quickly to get the buses back into the facility. We then went for a quick visit to a maintenance yard, where Stephen showed me the garage, the wash bays as well as their heavy maintenance facilities. Buses at the transit centre. Salem- Keizer has a fleet of approximately 100 vehicles, including paratransit and transit specifically for Medicaid. The service is certainly growing – it is looking into implementing a U-Pass program, as well as a network structure modeled after three C’s: Centers, Corridors (primary frequent service lines), and Circulators (local lines connecting residential and outlying commercial areas to the corridors). 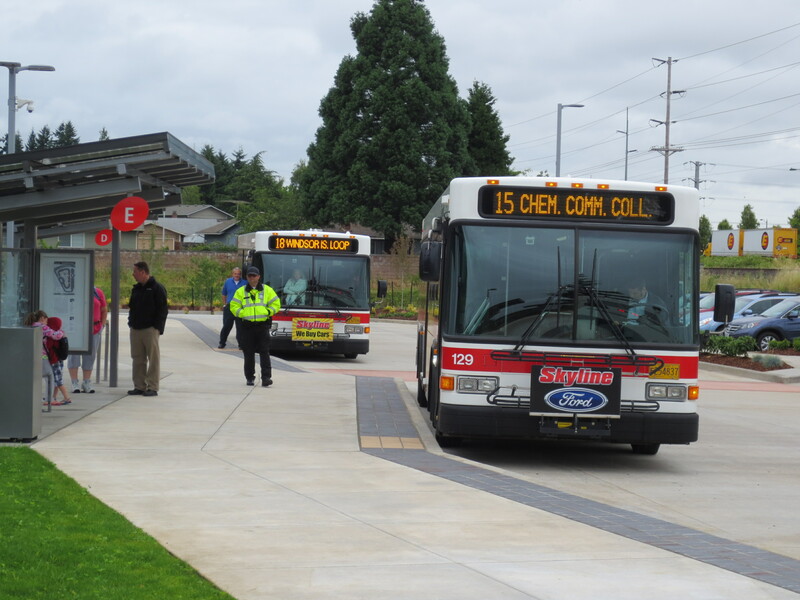 Our final stop was at Salem-Keizer’s newest park and ride, Keizer Transit Center. I was fortunate enough to visit on June 24th, which just happened to be the first day of operations at the state-of-the-art facility. Currently serviced by four routes, it has the capacity to serve eight. The facility offers 52 park and ride stalls, and is at the forefront of sustainability and innovation. At the centre of the facility is a building with a waiting area and crew room, outfitted with solar panels, a green roof, and rainwater collection for the rain gardens. For passengers, there are washrooms, helpful information panels, including schedule information on television screens (real time information to be coming soon), and free WiFi! 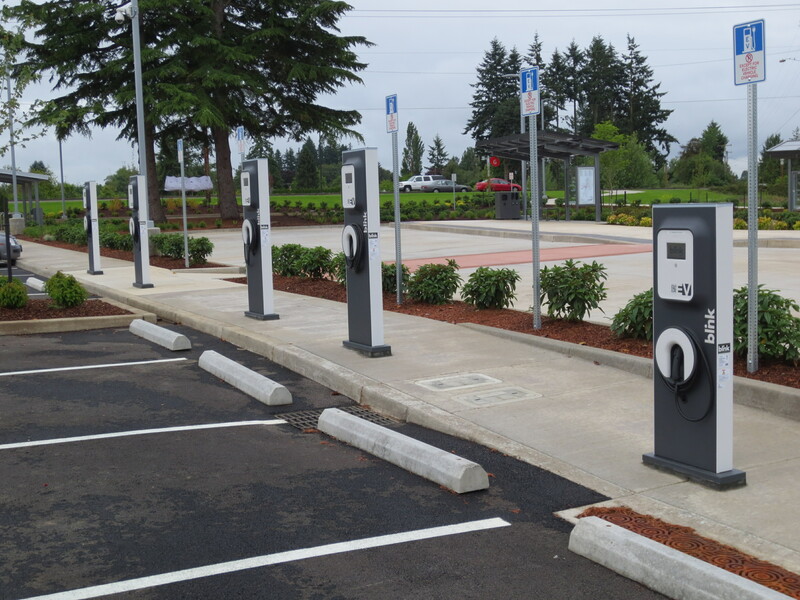 There are even electric vehicle charging stations. Congratulations to Stephen and his team on the successful completion of such an amazing facility, and thank you Stephen for taking me around town! The Buzzer blog is documenting the travels of TransLink’s William Hui while he takes public transit from Vancouver, British Columbia to Portland, then Salem, Oregon! As promised, I did a quick debrief in the form of an email interview with William after his trip from Vancouver, BC to Portland, then Salem, Washington. Here’s that interview, some photos William took along the way, plus specifics on his schedule and notes for the trip if you want to take the same trip as William! You originally planned to go from Vancouver to Portland on public transit, but you went further to Salem. Why? William: I actually wanted to see how far south I could get on transit, so Salem was part of the original plan. If I could have gone further south, I would have. But given that I couldn’t really get further than Salem, I called this the Portland trip since I spent a weekend there anyway and more people can associate with Portland. Was it hard to organize this trip? William: Not really. ­As I had mentioned before, others had done parts of the trip before me, so I wasn’t starting from scratch. Google was a big help too. It was a bit frustrating at one point because the website for Twin Transit didn’t work, so I had no idea how to get schedule information, but once I got that, it was fairly straightforward. I should also mention that it took some sleuthing to find out where my transfer points were located. One of the transfer points was Chehalis (Walmart). There’s no cross-street listed, so I had to do some Googling to figure out where this Walmart was, not to mention that I had some apprehension about finding the actual stop. I’ve learned that naming stops using retailers at landmarks is actually common practice in the US. What was the high point of your trip? William: Upon reflection, taking the number 40 from Olympia to Elma and knowing the 90 was running that day. Being reassured I wasn’t going to be stuck in Elma while cruising down a beautiful highway was very pleasant. What was the most challenging aspect of your trip? William: The most challenging part of my actual trip was the walk across the border. It was pouring rain and I was pretty soaked when I got to Blaine. I ducked into a Library to warm up and dry off. What I had mentioned about the border in the first post didn’t turn out to be bad at all ­ the border guard was very nice and didn’t give me a bad time about what I had said about taking the bus to Portland. The 90 showed up as well, so that didn’t turn out bad. It didn’t have a destination sign on it, so I’m glad I asked the driver if he was driving the 90 route instead of waiting patiently at the transit station. How was public transit similar or the same on the other side of the border? William: It was different on different legs since I traveled on small transit systems (Whatcom County and Lower Columbia, for example) and larger transit systems (Sound Transit and TriMet, for example). But in general, I observed that the American transit systems are built to serve park and rides and have very much reduced service on weekends (some don’t service at all). This seems to suggest that their services are built to service commute trips, and not discretionary trips. I also noticed that public art is a really big thing in Oregon. One other thing is that due to the economic situation in the US right now, the federal government has stopped giving grants to transportation agencies, so a lot of passengers were talking about cuts to their services. We’re fortunate in Vancouver that we’re having discussions about how to pay for transit, not what to cut as some communities are forced to do south of the border. What did your fellow passengers think of your trip? William: I didn’t end up talking to a whole lot of people since people chose to sleep on the longer runs or talk about cuts to service. Those whom I did talk to didn’t think much of it, although by that time, I had already passed Olympia, so I was much closer to Portland. Would you do this trip again? Do you have any similar style trips planned in the future? William: Yes, I would do this trip again. However, one of the routes that was apparently at risk for being cut was the 90 from Elma to Centralia, so there may be a limited window for doing this exact trip again. Since it’s a bus route that only runs Mondays and Fridays (not Mondays to Fridays), the ridership must be quite low, so I can imagine why it is at risk of being cancelled. However, there is talk about extending Twin Transit north to Tumwater, to restore a connection previously provided by Cap Transit, so there is a more direct connection between Olympia and Centralia (I’m not sure about the Rural and Tribal Transit item as they do not seem to have a website). I do have similar trips planned for the future. I will actually try to investigate if I can go from Salem to Nevada and into California somehow. I had originally tried to get from Salem to Eugene and south to California, but that doesn’t seem to be viable, but if I can go around into Nevada, I can technically go all the way to the US-Mexico border. But I do know one can travel from San Francisco to the US-Mexico border, so I might try that, or a train trip in Europe, or something down the eastern seaboard of the United States. Route 55 from Blaine to Cordata Station: we had to go on a detour as the I-5 was congested. It made me late for the 331, but having extra time, I took the 232 and made it to Downtown by 3pm and was able to make my next connection. Route 510 from Everett to Seattle: the I-5 was super congested (we sometimes sat in the HOV lane going nowhere fast). I didn’t get to my connection point until 6:45 p.m. or so. I got on the 590 from Seattle to Tacoma around 6:55 p.m. and arrived by 8:00 p.m. in Tacoma. The 105 from Salmon Creek to Portland was also delayed. It didn’t come on time, so I got on at around 5:20 p.m. and the driver took a bit of a break at an intermediate park and ride, but somehow still made it to Downtown Portland by 6. The Chehalis – Longview link will be broken as of July 1, meaning a possibly longer coastal route via Pacific County, Astoria and Tillamook. We might have some more info on the blog about William’s time spent in Salem in the not-too-distant future. We would love to find out if anyone else has done or is planning to do the same or similar route on public transit. Leave a comment here, and tell us all about it! William’s Travels: William completes his trip from Vancouver to Portland and Salem, Oregon on public transit! William’s journey was a success! Not only did he get to Portland via public transit, he got as far as Salem, Oregon! As mentioned in the last update, William took the Amtrak home. He said the train ride was fun, especially since the rail line weaves back and forth with the I5, so he passed a lot of familiar places – places he had passed on his ride down on the bus. William’s journey on Twitter #yvrtopdx! It’s been fantastic for people to follow William’s updates on @thebuzzer on Twitter and the #yvrtopdx hashtag. I know William appreciated the support and the enthusiasm for his passion of all things transit! @thebuzzer good to hear – Ive been thinking about this trip today!! Now that he’s had a day back in Canada, I’m gathering specifics on William’s travel schedule as well as his perspectives on the trip in general to share with all of you. Stay tuned! 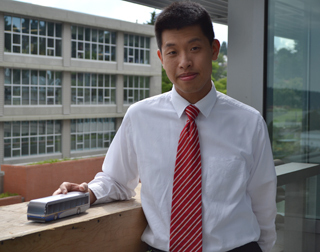 Over the next few days, the Buzzer blog will be documenting the travels of TransLink’s William Hui while he takes public transit from Vancouver, British Columbia to Portland, Oregon! William is ready for his adventure! Many of us in Metro Vancouver have visited Portland before. The mode of choice for this journey is usually car, train, intercity private bus, plane or boat. But is it possible to take public transit all the way? This is a question TransLink systems engineer William Hui said he wanted to answer when he told me about his plan over a year ago. Tomorrow morning, William’s idea becomes a reality. He’ll start his journey Thursday in Vancouver on a Coast Mountain Bus and will hopefully alight a C-Tran bus in Portland, Oregon around 6 p.m. on Friday. Before he set off on this historic trip, I thought I’d ask him a few questions. Why do you want to take public transit from Vancouver to Portland? I’m a bit of a transit geek (and that’s putting it lightly), and I thought it would be a cool thing to do. Most people drive, some people take the train or a plane, but taking city buses all the way down is not something you hear about often, and I thought it would be a neat adventure. The first part of my trip will be to Portland, but just to get as far south as I can, I’m going to Salem before coming back to Vancouver. I think someone sent me a blog post of someone going between Seattle and Vancouver. I wondered to myself how far south I could actually get using public transit alone. How long have you been preparing to do this? I hatched the idea last summer, but I didn’t start seriously planning the trip until this spring. Tell me about the planning process. How did you line up schedules and figure it all out? In truth, Google did the leg work. Believe it or not, there are other transit enthusiasts out there who have looked into this. Here’s a link to taking public transit from Vancouver to Seattle, Seattle to Vancouver and Seattle to Portland. Some of the information is a bit dated, but once I got the general idea, I basically just went online: I went to Whatcom Transit (the service in Blaine) and saw how far south that would take me. Then I saw what services were available at that point and repeated the process until I got to Portland. Nine hours from Bridgeport to Tacoma. Ten hours from Tacoma to Portland (with a 2-hour stopover in Chehalis). Two hours from Portland to Salem. So, about 20 hours of travel time, but it can’t be done continuously from one end to another due to bus scheduling. How are you going to spend your time waiting for the next bus? Are you bringing a good book with you? I’m actually going to do some exploring at my layovers. One neat thing about this trip is that I’m going to be stopping at places where most people wouldn’t think to stop if they were driving. For example, when people go to Bellingham, they go to Bellis Fair or the Costco, but how many have visited Downtown Bellingham (they’re not the same place!)? I’m also looking forward to spending some time in Alma, Chehalis/Centralia. Will you have any time to enjoy Portland and your stops in between? Yes, I’ll be spending the weekend in Portland, and in addition to what I mentioned above, I’ll have some time to check out the Link in Tacoma. Two parts of my journey are a bit challenging: the border and the bus between Elma and Centralia. I’ll have to walk across the border, and I can just imagine the raised eyebrows I’m going to get when I tell them where I’m going and how I’m getting there. Secondly, the bus from Elma and Centralia runs only Monday and Fridays – not Mondays to Fridays, but only two days of the week. It also runs only 3 times during those days, so if it doesn’t show up, I might have some trouble getting to Portland. Very much so. 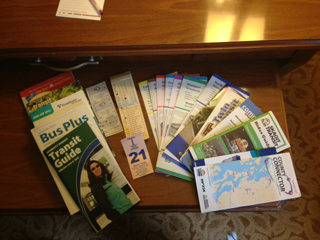 I’m looking forward to riding buses across 11 different transit systems and just seeing what’s off the beaten path. William will be communicating with us along the way, and we’ll update the blog on his progress as well as feature his thoughts on the trip after it’s all done. We’ll also be tweeting his progress on Twitter, so you’ll want to follow his progress at @thebuzzer. We wish William the best of luck on his trip!